Sweet Tea is about as southern as you can get. 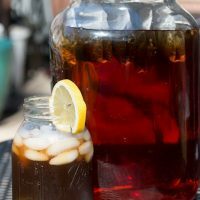 Southern Sweet Sun Tea is how we roll in this Southern household! Tea is one of the most popular drinks in the world, up there with water, coffee, and beer (which are all things I love). You can go to every single restaurant south of St. Louis and find yourself a pitcher of sweet tea. As someone who isn’t from the south, I thought sweet tea was strange since every table also has a fair number of Sweet ‘n Low, Equal, and raw sugar packets. I always assumed everyone added sweetener to their liking. Southerners typically don’t like a touch of sweetness in their tea, we like it pretty darn sweet. My mom often made sun tea growing up. Nothing is more memorable than mom making a big container of tea, sitting it on the porch, and letting it bask in the sun all afternoon. Mom would take the warm container after sitting in the sun for a few hours and toss it in the fridge. I can still have childhood memories of the summer sunshine on my face while drinking a refreshing glass of sweet sun tea. Nothing says summer like sweltering heat and an ice cold glass of sweet tea in a sweating mason jar. 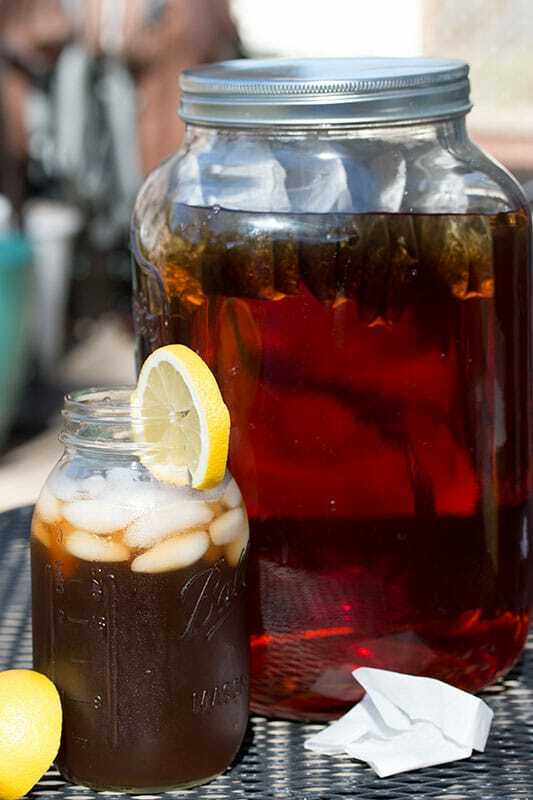 You need three things to make sweet sun tea: black tea, water, sugar, and a glass container. The container doesn’t necessarily need to be glass, but I choose glass because it helps the sunlight heat up the water and because I’m nostalgic. Glass containers are also easier to sterilize. You do however want a container that is pretty clear, so a clear plastic container will work. Your container should be roughly a gallon in size (or larger). I also like to have a container with a pour spout. I’m lazy, so I like to be able to take my warm sun tea and just toss it in the fridge. If you are using a pour spout, make sure it has also been cleaned and sterilized. Water is the most important part of making tea. If your water doesn’t taste good, neither will your sweet sun tea. If your tap water tastes good and you drink it on the regular, just fill up your container. However, if you’re water doesn’t taste very good, I recommend picking up some at your local mega-mart. Another option is to filter your own water. Your average run-of-the-mill black tea will work. Anything you can pick up at your local mega-mart will work as long as it’s in bags. You can use loose tea, but you’ll need to strain your tea to remove the leaves or pick up a metal tea ball. Another great invention is disposable paper filters. The kind like you can buy Lipton in, except you get to put whatever tea you want inside. Brilliant! You can also use higher-end black teas. Your favorite green tea can also be used. I love green tea with just a hint of honey. You’ll need 4-8 bags of tea for every gallon of water you use. For this post, my container can hold up to two gallons of tea, so I’m using 8 tea bags. Some folks use more tea bags for a stronger flavor. I prefer to use less and just let my tea sit a little longer. 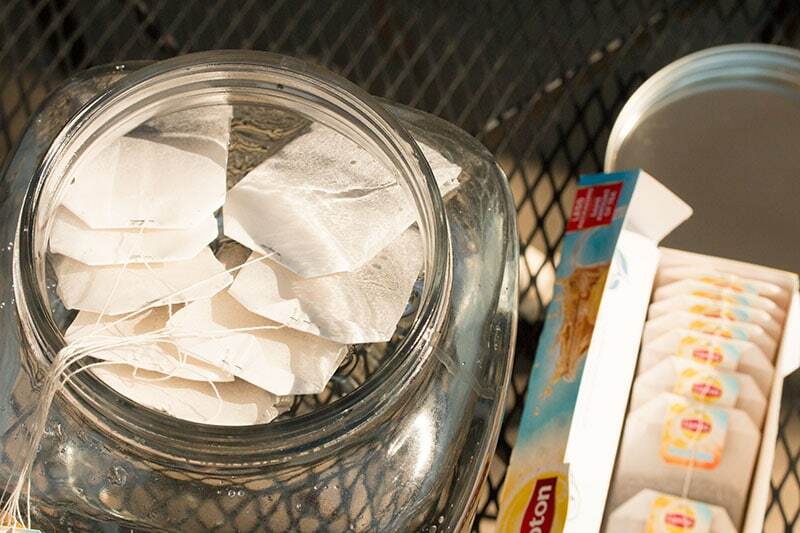 So, fill your container with water, add your tea bags, and put on the lid. Place the tea out in the warm sun. How long you let your tea rest is up to you and kind of up to your surroundings. If it’s a nice cool spring or fall day, your tea might take as long as 4 hours. If it’s blazing hot outside, like it usually is in the deep south, your tea might be ready in 2-3 hours. Honestly, I don’t think it really matters. At the end of the day, you’ll be left with a great tasting tea. Do not leave your tea in the sun for longer than 4 hours. You’ll know when your tea is ready when it’s dark in color. You can also give it a taste. If you want it stronger, go ahead and let it go a little longer. There are a large variety of sweeteners you could use. Normal table sugar is the tradition here in the south. This is the route my wife and I normally go when we want sweet tea. However, I like variety, so I also like to make a simple syrup and add the syrup to my liking. To make a simple syrup, just take a cup of water and a cup of table sugar and bring it to a boil. Let the syrup cool. Transfer to a container you can easily pour from. 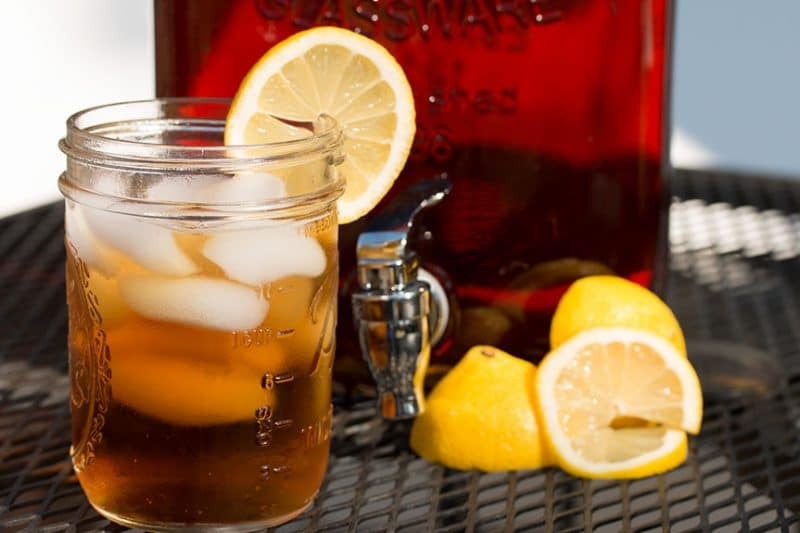 You can then use this syrup to make your sweet tea as sweet as you’d like. You can also add all of the syrup to your finished tea, but that’s completely up to you. Honey, agave, or anything that’s sweet can be used as a sweetener. If you’re crazy, you could even go with a bit of molasses, but that might add a more prominent bitterness. My wife and I have gone as far as making raspberry syrup for adding some pizzazz to our tea. Just add about 1 cup of fresh raspberries to 1 1/2 cups of simple syrup while it’s hot. Mash the berries up and then strain the liquid. Fresh lemons are almost always available at our house. If you don’t use enough lemons to keep a healthy supply hanging around, you might want to consider keeping a supply of True Lemon. True Lemon lasts for a really long time and tastes better than the fake lemon juice from a jar or plastic lemon. 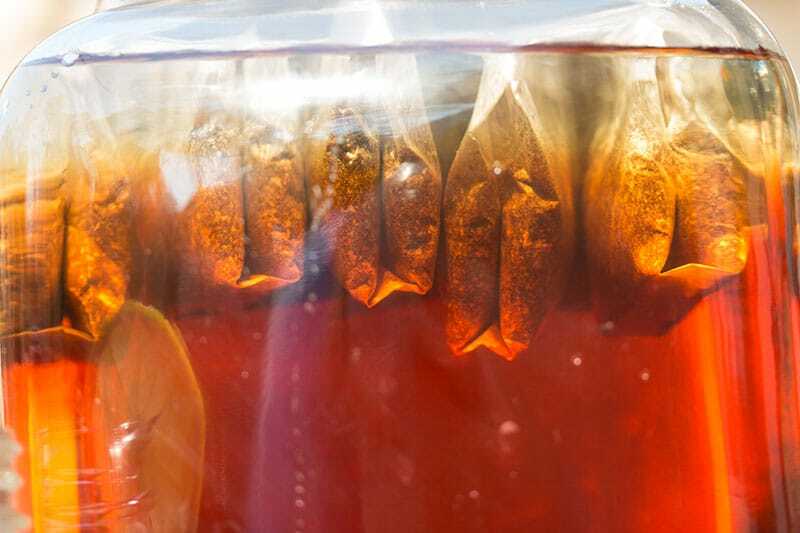 Once your tea is done soaking in the sun, bring inside and place it in the refrigerator to cool. Serve over ice with a slice of lemon and your favorite sweetener. Toss the remaining tea in the fridge and it should stay fresh for 24 hours if it lasts that long. To reduce the bitterness in tea, add a pinch or two of baking soda. This trick also works whenever you have over-steeped regular tea too! On a side note, my grandma used to swear that the same thing happens to coffee whenever you add salt. She just used to put a few shakes of salt right into her coffee grounds before making it. 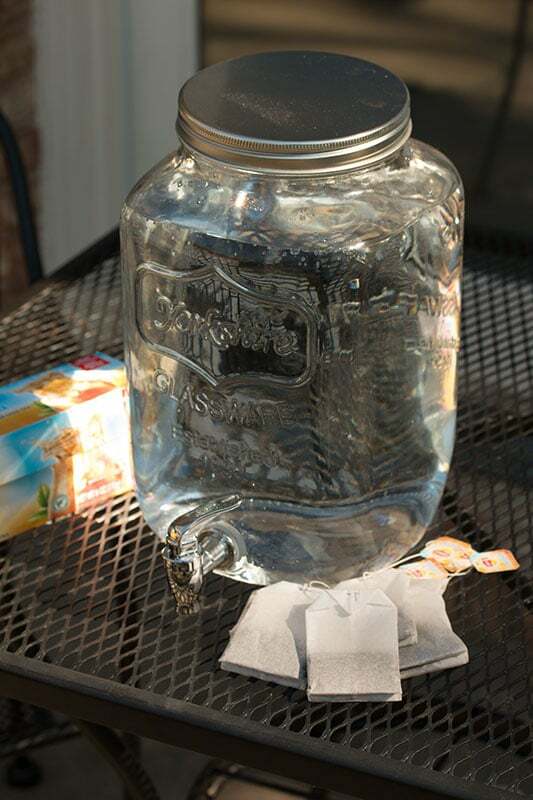 **Important Note: Sun tea can harbor bacteria, to reduce the risk be sure to sterilize your jar prior to using. Do not leave this in the sunlight for longer than 4 hours. Do not make more tea than you will use in a day, or discard unused tea after 24 hours. If you see floaters or strands in the tea, discard it as these things may be bacteria forming. The risks can be minimized by sterilizing your jar and boiling your water before use. Black tea appears to have an enzyme that may protect against some strains of bacteria from growing in sun tea. Sweet tea is as southern as it gets! This one is sun-kissed! Sterilize a clear container that will hold as much water as you are using. Add water and tea bags to the container. Set in direct sunlight for 1 to 4 hours or until tea is the color and strength you prefer. Do not leave in the sun for longer than 4 hours. Place tea in the refrigerator to cool. Serve over ice with sweetener and lemons. Other flavors can be added. Alternately, this can be made in the refrigerator, it will just take longer. 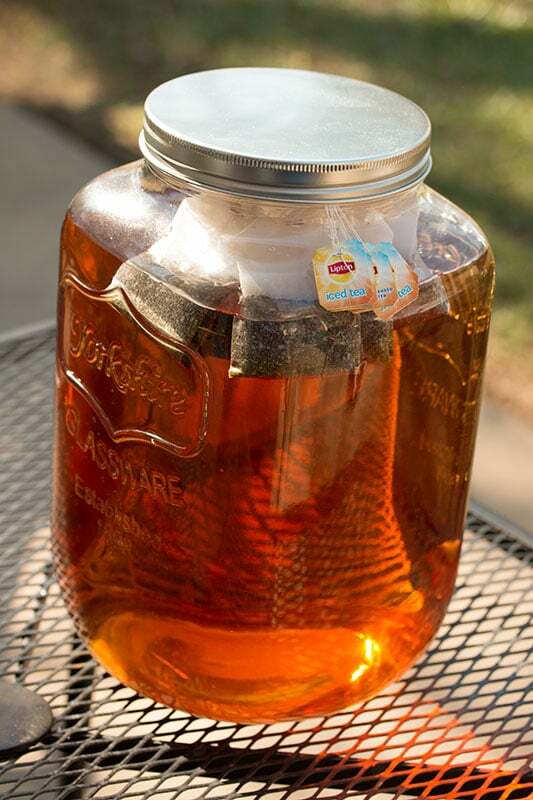 **Important Note: Sun tea can harbor bacteria, to reduce the risk be sure to sterilize your jar prior to using. Do not leave this in the sunlight for longer than 4 hours. Do not make more tea than you will use in a day, or discard unused tea after 24 hours. If you see floaters, strings, or strands in the tea, discard it as these things may be bacteria forming. Thanks for stopping by and leaving a comment & review! I make this all summer long–we need a new batch every couple of days! It is fantastic–with lots and lots of sugar as stated in the previous review!! Love it! Just like our Grandma’s too! With lots and lots of sugar. Did we mention she loved sugar? Hahahaha!